Funk masterclass with the original members of the James Brown Review. Funk legends Pee Wee Ellis and Fred Wesley present this interactive workshop using special backing tracks developed for ProMusicTutor. Participants will be organised into three groups – Bronze, Silver and Gold depending on ability and compatibility – and will create their own versions of the music provided under the guidance of Fred and Pee Wee. At the end of the workshop, each group will perform their piece with Fred and Pee Wee joining in! An unmissable opportunity to meet, learn from and play with two masters of their art. Pee Wee Ellis and Fred Wesley were part of the greatest ever horn section, The JB’s, who toured, recorded and wrote for James Brown in the 60s and 70s. Playing funk, gospel and jazz, together these two will take us back to the day when soul reigned supreme. Featuring a stellar line-up of Laurence Cottle (bass) Tony Remy (guitar) Gareth Williams (keys)and Mark Mondesir (drums). Workshop tickets include a complimentary ticket to concerts in the main auditorium or 50% off Lantern concerts. 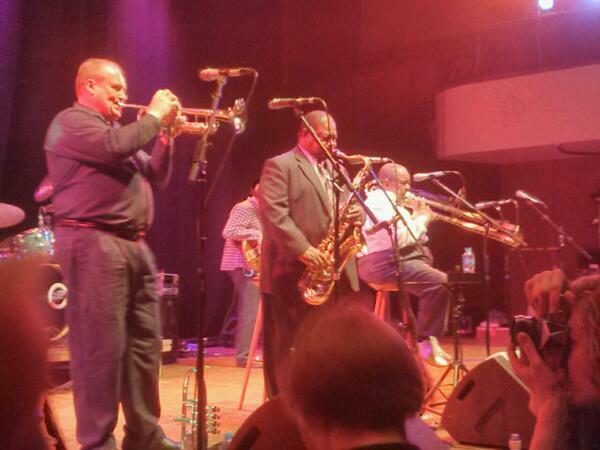 Fred Wesley, along with Pee Wee Ellis, is another of those credited with the advent of Funk. Fred is a trombone player who stayed with James Brown through the 70s and today fronts his own group, The New JB’s. He has also worked with Parliament-Funkadelic, Tina Turner, Ray Charles and Count Basie.